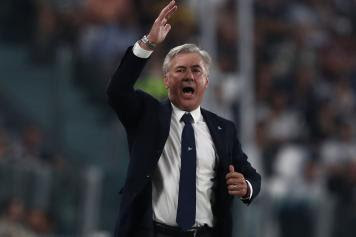 Carlo Ancelotti has expressed fears over a possibility of Napoli getting screwed by Arsenal in the fast-approaching Europa League quarter-finals. The Italian side managed a draw against a Genoa team who had been reduced to 10-men due to red card. The away side looked as dangerous as a complete team would be and despite their reduction in the first half, they were still able to grab an equaliser. Napoli's approach to the game, as well as that of midweek which they lost to Empoli, was poor according to their boss - he stated during his post-match press conference that they will be in for trouble shout they repeat that display against Arsenal. "Arsenal? I don't think that the players were thinking ahead of themselves," Ancelotti said after the match (via Calciomercato). "We didn't have it easy against Empoli last week and we had a difficult time again tonight against Genoa. "Defending? We defended bad at times yes especially considering that it was 11 against 10. We didn't control the game well with the man advantage and we paid for our mistakes in the end. "Again on Arsenal? Well if we play this poorly against them then we will be in serious trouble. We have to work hard in the coming days to prepare well for the Arsenal game." Arsenal also need to improve on Sunday's performance if they are to maintain their hopes of progressing to the semi-finals. The Gunners suffered a 1-0 loss to Everton in what we could call a jaded and lacklustre display from the side, thereby blowing off the chance to climb to third spot. Things could become better because there is a possibility they will be having some of their injured players who could not feature yesterday back in the team. Laurent Koscielny and Granit Xhaka were totally absent while Aaron Ramsey who got introduced later in the encounter lacked full fitness..